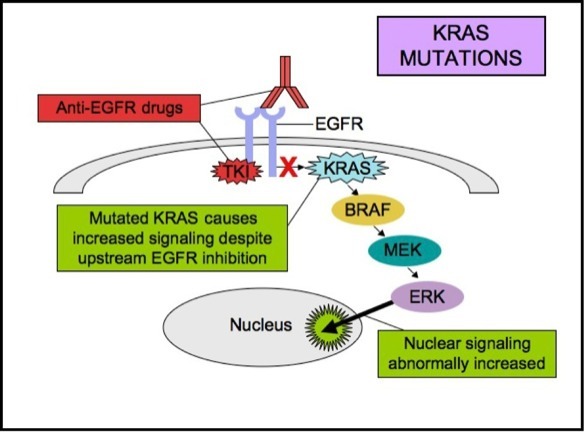 Not only is mutant KRAS difficult to restrain, its presence in some types of cancers predicts that there will be no response to other targeted drugs. For example, patients with colorectal cancer may benefit from additional treatment with an antibody drug that targets the EGFR protein (cetuximab or panitumumab). However, this benefit is seen only in patients who have a “wild-type” (not mutated) KRAS gene. The reason for this is that EGFR and other related receptor proteins rely on KRAS to transmit proliferation signals. Because direct inhibition of KRAS remains a “holy grail,” there have been numerous attempts to inhibit the proteins that are activated by mutant KRAS (i.e., those that are “downstream” of KRAS), most notably MEK1 and MEK2. These two proteins are part of an important pathway named MAPK, which is governed by KRAS. MEK1/2 are activated by KRAS and by another protein, BRAF, which is frequently mutated in melanoma. The U.S. Food and Drug Administration (FDA) has already approved two inhibitors of MEK proteins, trametinib and cobimetinib, as part of treatment for melanoma with mutated BRAF. MEK inhibitors, however, have shown little to no activity in clinical trials for cancers with mutant KRAS. Just recently, a large trial that compared the MEK inhibitor selumetinib plus the chemotherapy drug docetaxel versus docetaxel alone in NSCLC produced disappointing results. This most likely implies that inhibiting MEK in the presence of mutant KRAS activates other cellular pathways that ultimately bypass MEK inhibition, leading to unrestrained cell proliferation—as was shown, for example, in this study. Nevertheless, there are still trials ongoing with the MEK inhibitors trametinib and binimetinb (also known as MEK162) combined with other drugs (chemotherapy or targeted drugs) in KRAS-mutant cancers. Some success was reported from a small trial that combined an investigational MEK inhibitor known as PD-0325901 with palbociclib. The latter is an inhibitor of CDK4/6, proteins that drive cell proliferation, and are ultimately activated by KRAS. Palbociclib is already FDA-approved for breast cancer in combination with hormonal therapy (KRAS is rarely mutated in breast cancer). In this trial, NCT02022982, patients with KRAS-mutant cancers (lung, ovarian, or thyroid) experienced clinical benefit that lasted for over 6 months in 7 out of 25 patients. Another possibility is that KRAS-mutant cancers, in particular NSCLC, may have a better response to immunotherapy—treatment that helps the immune system fight cancer. KRAS mutations are found much more frequently in NSCLC that develops in smokers. These cancers are associated with a high total burden of mutations, and data indicate that this is a good predictive marker of response to immunotherapy drugs known as immune checkpoint drugs (nivolumab, pembrolizumab, etc). Indeed, amongst NSCLC patients who responded to immunotherapy in a clinical trial, almost half (7 of 14) had a KRAS mutation, and only one of 17 patients who had no response to immunotherapy had mutant KRAS. Another study analyzed outcomes of immunotherapy in NSCLC and concluded that co-existence of KRAS mutations with mutations in TP53 (a prominent tumor suppressor gene) may predict a good response to immune checkpoint blockade. Given these results, trials that combine inhibitors of proteins downstream from KRAS with immunotherapy are of interest. For instance, one ongoing study (NCT02779751) combines a newer CDK4/6 inhibitor, abemaciclib, with the immune checkpoint inhibitor pembrolizumab. More trials like this are currently being designed.